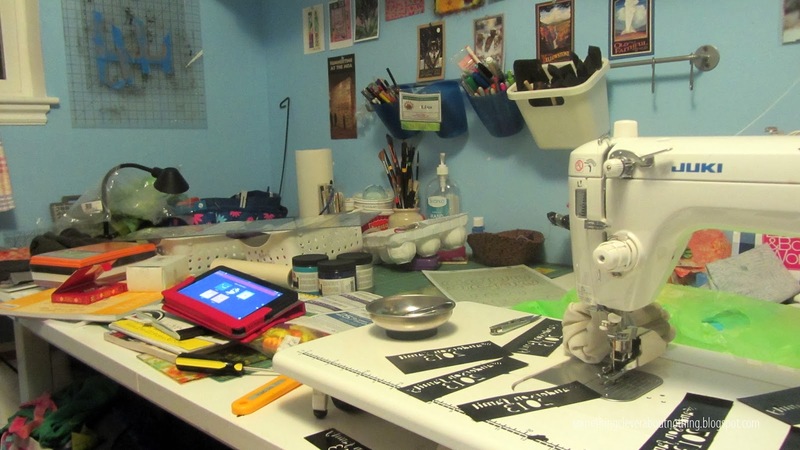 After the holidays my studio was looking pretty messy. Leftover pieces of vinyl from the Christmas Ornament project were everywhere. Bits from other projects had been shoved this way and that and then my Christmas gifts had been piled on top of all that. Time, once again, for some organizing and cleaning. 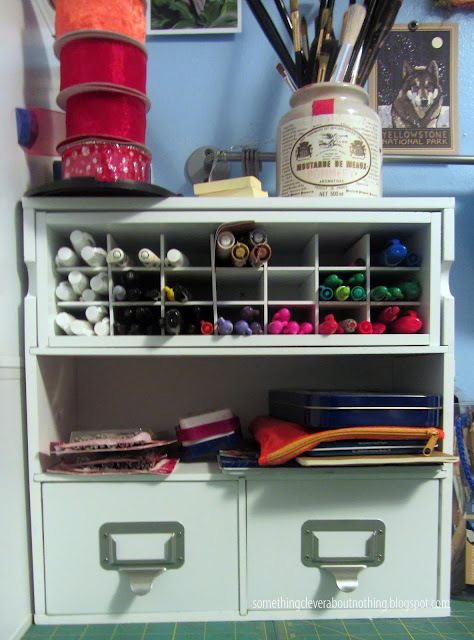 Thanks to a great sale at the local craft store, and a generous gift from my Mother-in-law, I was able to purchase some lovely drawers and find homes for my stuff. There is now even a spot for my dress dummy. I still need to come up with a name for her. All of the drawers came unassembled and I spent almost an entire season of Torchwood putting them together! I think it was worth the time! I also added the extender into the table and turned my stash shelves to the side to make more room for the extra table space. Mister approves of the new wide open spaces. Although he also approved of the messes. He likes making himself at home anywhere I am. I can now see all of my markers!!! I didn't realize I had so many duplicate colors. I guess I like the same colors every time I find the markers on sale. Although all those white markers are duplicates on purpose - well sort of. . .
My very clever Sister snuck a look at my private Amazon wish list while she was in town for Thanksgiving and found that I've been pining away for some Sharpie White Poster Markers so she bought me a set of 12! 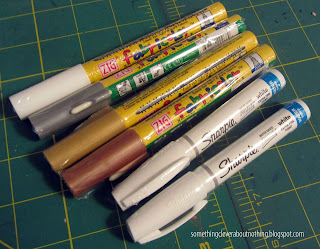 She also bought a set of Zig Fabricolor metallic markers! I guess I better get to work and figure out what I am going to use these fun new toys on! Are you working on organizing your craft/sewing supplies this month? I'd love to see what you are doing! I am even now, between reading and drinking coffee, in and out of the studio trying to figure out how to add 20 square feet to the place!!! I'll have to rearrange it somehow. What are you using the white sharpies for? Do they write on fabric and is it stable? Maria Elkins wrote something about a marker eating thru her fabric. Your mister is soooo cute. The poodle won't get near the studio usually. Always good hear about storage and marking pens. Your post is making me think that my pens need to be more organized also. Eager to hear more! I like your new organized space. I find that after I have been working awhile the room degrades to a mess. I need to periodically clean up to avoid a clutter overload. I have been cutting up odd bits of fabrics into set strip lengths and I put them in a rolling drawer unit to use them when I need a piece of colour or to do some wonky piecing. I am wonky piecing to learn more about what I like together in colour and value. I am also cleaning my space to uncover a desk so that I can work on a clear space for writing and other related tasks. So far I haven't made that space clear. I need to organize all the papers on it! Do you like the zig fabric metallic markers? I like to highlight area on fabric pieces but haven't found a marker I like yet. 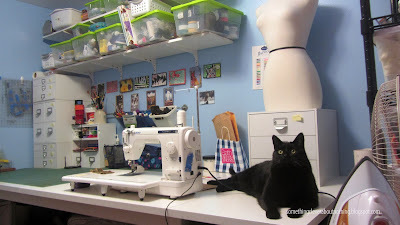 This is the first year that christmas did NOT invade my sewing area - just because I told everyone that its not allowed in there! But I want to know - how did my cat get in the picture? Grin! Kali looks just like that just a bit thinner! Great organizing shelves! (where are the labels??!) I think your dress buddy needs a blog contest to come up with suggestions with a prize of some of your hand dyed fabric! The drawers look wonderful, and the marker storage is brilliant. You've inspired me to go and organize something! It is inspiring to see your results! I am working on organizing my art studio and it is going to take at least the entire month. Photos like this help me remember why it is worth doing it. :) Thanks.